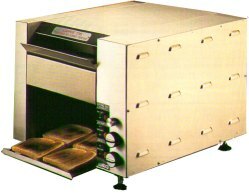 Catering and industrial toasters, either multi or conveyor. Bread toasters, Combi toasters, thick 'n' thin toasters and bun toasters. 1 to 6 slice capacity with either White or Black heat elements. Full range of Dualit toasters for café, hotel or kitchen.